Oak, pine, ash, birch and elm bedroom, dining and living room furniture ranges all handily placed in one place for you to browse around. We have Sussex antiqued oak furniture, Nailsworth light grey lime washed birch Georgian style furniture, Courchevel antique white painted dining furniture with oak tops, weathered oak furniture, rustic and reclaimed pine furniture and our very own favourite the Bronx solid oak range of bedroom, dining and living room furniture. Latest additions - Empire reclaimed oak furniture, Winchester grey-wash furniture, Studio industrial and warehouse style furniture with either a heavy rustic or metallic and often heavily distressed look, Kentish contemporary oak occasional and dining furniture, Country ash, elm and oak dining and kitchen furniture, Naturals wooden living room furniture including Natalie Natural coloured sofas and chaise longues. Cannes white painted distressed furniture with solid wood limed tops and driftwood beachcomber style occasional furniture! The Bronx oak furniture collection is a fabulous collection of contemporary solid oak furniture at prices you used to pay for pine! Over 60 pieces of oak furniture for the bedroom, dining room, kitchen and living room including lots of different dining tables and a selection of home entertainment furniture. FREE delivery! Click on the image or link above to view our Bronx furniture range. The Cannes collection is a range of French inspired white painted lightly distressed furniture with limed solid oak washed tops. The Cannes furniture range includes glass fronted cabinets, shelf units, a selection of occasional tables, chests of drawers, a bedside chest and coat racks. Click on the image or the link above to view our Cannes furniture range. Country Ash, Country Elm, Country Oak, Sea Grass and Guildford dining / kitchen furniture all crafted using traditional farmhouse and country designs. The large collection includes dining tables, dining chairs, sideboards, occasional tables and more! Click on the image or the link above to view the collection. The Courchevel dining furniture range is a range of antique off-white painted dining furniture with limed oak washed tops. Continental influenced dining range with a modern light and practical finish. The reproduction brass handles and escutcheons add an antique feel to finish off that French country house ambience. The Courchevel range includes a dining table and chairs and French country style lightly distressed grey painted pieces also available here. FREE delivery! Click on the image or link above to view our Courchevel furniture range. This is a range of unusual and visually interesting driftwood occasional furniture and mirrors with a collected from the beach appearance to bring the seaside into your home. The driftwood collection includes driftwood occasional tables - round, square and rectangular driftwood coffee tables all with glass tops plus a selection of driftwood mirrors, and LOTS more without glass tops including sideboards, a dining table and occasional tables and lighting. Click on the image or the link above to view the Driftwood collection. 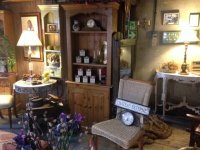 The Empire furniture collection is a collection of reclaimed / old pine furniture some with carved detail and with many pieces you don't usually find on the high street all available to order today from Harvest Moon. The collection includes Empire reclaimed pine / old pine bedroom, dining and living room furniture. Over 50 pine pieces to choose from. Click on the image or the link to view our Empire furniture collection. The Kentish oak furniture range is a contemporary range of bedroom, living room and dining furniture with a bedside chest, a chest, a selection of occasional tables, a dressing table, a low cabinet and a large 3 door 3 drawer sideboard. The Kentish range features contemporary oak furniture with louvred shutter effect doors and drawer fronts, chamfered edge details on drawers, dovetailed joints and round contemporary metal knobs. Click on the link or on the image above to view our Kentish oak furniture collection. Nailsworth birch light grey lime washed Georgian style bedroom, dining and living room furniture in a more compact size than many of the other ranges making it ideally sized for today's more compact homes and apartments. The Nailsworth range includes grey lime washed birch bedroom furniture, a dining table, dining chairs, sideboards, a bookcase, desks, occasional tables and a sofa, armchair and large stool. Click on the image or the link above to view our Nailsworth furniture range. The Natalie living room furniture collection is a small capsule range of Natural coloured hardwood furniture with a light limed wash complemented by the latest on trend natural coloured upholstery and to finish the look contemporary table lamps. The range includes a glazed bookcase, a shelving unit, a desk, occasional tables, refectory style dining tables, a chest of drawers, sofas and a chaise longue plus lighting and ornaments. Click on the link or image above to view the collection. The rustic pine furniture collection is a glorious range of rustic looking pine furniture with a wonderful mix of styles and individual pieces. All pieces have been left in the fashionable, unfinished, natural look. We also have reclaimed pine furniture made from eco-friendly reclaimed pine with thick, heavy construction and a natural weathered finish for your country coach house, cottage or modern city home. The rustic pine collection includes large pine bookcases and cabinets with Astragal glazed doors and carved mouldings and effects along with louvred pine cupboards, multi drawer units, false drawer units, chests of drawers, kitchen units, a distressed rustic pine monks bench, dining and occasional tables. FREE delivery! Click on the link or image above to view the collection. The Studio furniture collection is with a wide range of styles and finishes. The Studio collection is broadly themed on the Warehouse and Industrial styles that are currently so popular. Most pieces have either a heavy rustic or metallic and often heavily distressed even up-cycled look and feel and wood used includes oak, pine, ash, elm and reclaimed timbers. Most Studio items are living room / occasional furniture pieces along with some you might want to use in the bedroom, kitchen or dining room. Click on the link or on the image above to view our Studio furniture collection. The Sussex antiqued oak furniture collection is a small collection of superior antique look oak dining and living room furniture. Made from top quality oak timber and lacquered by hand to create a fabulous aged look with a beautiful patina. The collection includes a sideboard, dining and occasional tables, a banker's desk, a larger mirror and bookshelves. Click on the image or the link above to view our Sussex Antiqued Oak furniture range. This is a range of French solid weathered light oak bedroom, dining and living room furniture with a weathered / washed limed light finish bringing the back to life the light and airy look of the 1970's stripped pine success story. Top quality solid oak timber with traditional designs to stand the test of time. Some pieces feature exquisite carving detail and cabriolet legs, sculpted drawers and solid oak tops whilst others have a more contemporary style and feel to them making the weathered oak furniture range ideal for mixing and matching to suit your tastes. FREE delivery! Click on the link or on the image above to view our Wessex weathered oak furniture collection. The Winchester furniture collection of bedroom, dining and living room is now available at Harvest Moon. The collection is an exciting and eclectic range with classical overtones and a fashionable design point. with a grey-wash finish. Characterful shaped chests, a linen upholstered super king size bed and more. Unique and unusual items .. have a look at the carved mirror and the realistic rope-look mirror. Click on the link or on the image above to view our Winchester furniture collection.